DCS offers a great opportunity for campus work in our three coffee shops, catering services, summer conferences, pizzeria/ice cream parlor and of course the Diner, our main dining cafeteria. This group serves 70,000 drinks to campus and visitors each semester. Thank you for keeping us caffeinated Dive crew! DCS has three specific hiring timelines each Academic Year. We have applications open in August, November and April to bring new students into student worker roles. The Diner, Lillis Cafe, Diversions Cafe and Cellar/CStore hire for student lead positions each March. Summer conferences hires for the summer season in March as well. Current DCS student workers are eligible for transfer opportunities each Spring for the upcoming Academic year. Transfer applicants need to be in good standing with their supervisors/leads to interview. 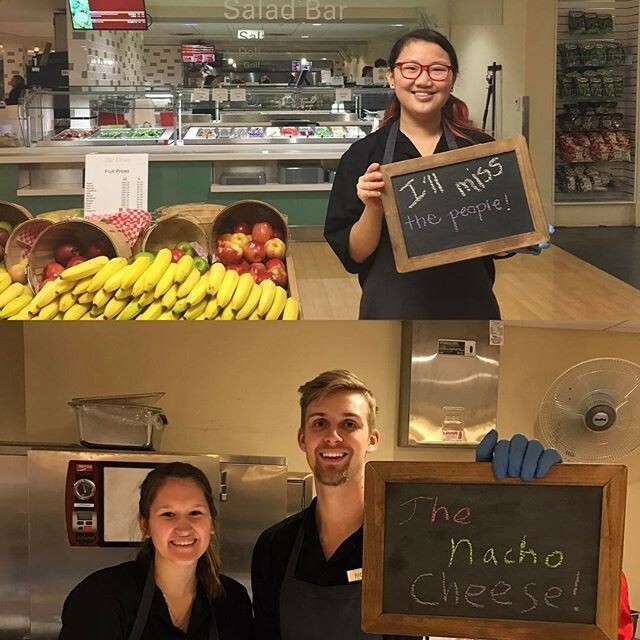 The University of Puget Sound Dining and Conference Services department employs students in many capacities throughout all of our operation. Student staff members must sign a University of Puget Sound employment agreement, provide proof of a Pierce County Food Handler's permit and complete harassment training; they may also be required to fill out a tax form and provide proof of eligibility to work in the United States. Dining and Conference Services keeps applications on file for hiring as needed. Applications are out three times each Academic Year; August, November and April. Student worker employment agreements are set up for 11/hrs week, DCS does plan and schedule that each student will commit to that hourly arrangement.